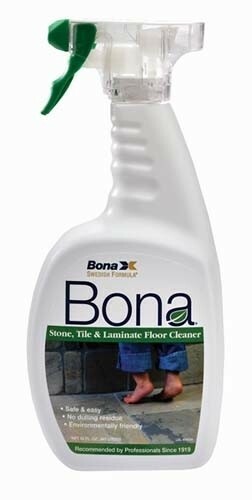 Bona Stone, Tile & Laminate Cleaner is a waterborne, environmentally responsible, and non-toxic cleaner specifically formulated to clean all types of stone, tile & laminate floors with a clear finish. Unlike other Cleaners, Bona Stone, Tile and Laminate cleaner leaves absolutely no dulling effect. Bona Stone, Tile & Laminate Cleaner is great using with all types of residential and commercial laminate flooring, ceramic tile, vinyl, sealed marble, and sealed granite floors. This Hard Surface Cleaner is also great for sealed countertops and stainless steel surfaces.